Here come the cold nights… are you well-prepared? Some people love to “chill” at their patio enjoying the cool breeze at night. But during those days when it can get extremely cold, one needs an outdoor heater. 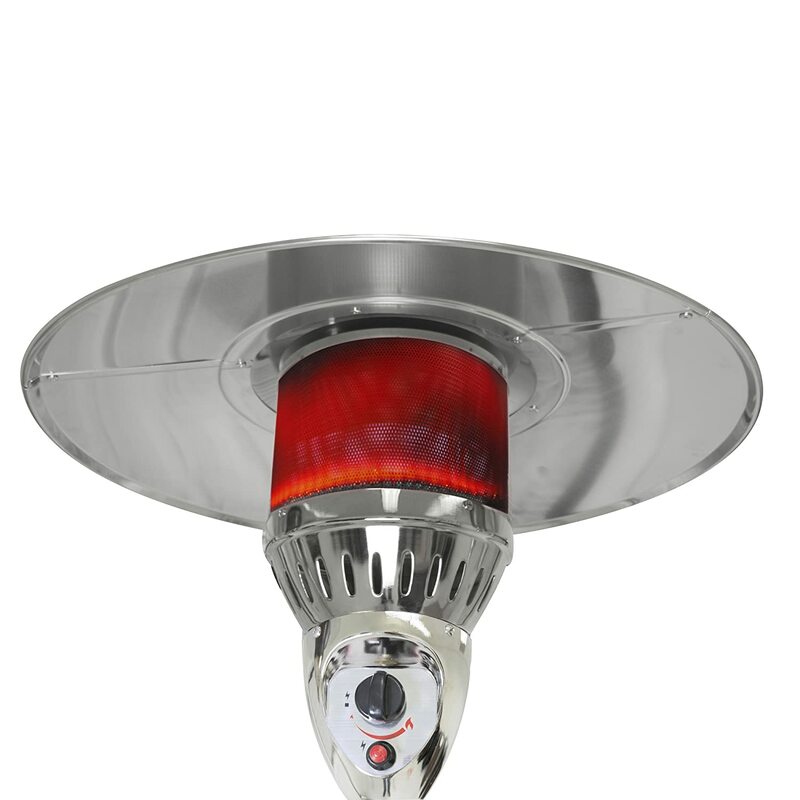 Dyna-Glo has a reliable catalogue of heaters, from kerosene fan-forced types to convection heaters. One of them is the Dyna-Glo DGPH201BR, a freestanding LP-gas heater with a beautiful hammered bronze exterior. But is it any good? 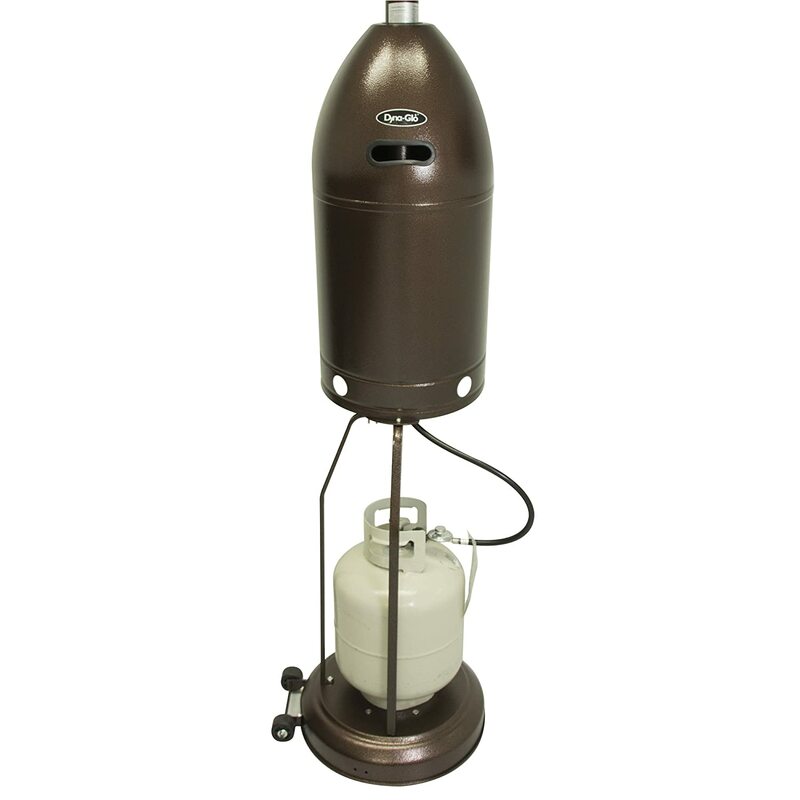 In this Dyna-Glo DGPH201BR patio heater review, we give you what previous buyers say about their unit. 3 Dyna-Glo DGPH201BR Patio Heater Review: Should You Get One? First, let’s check out this outdoor heater’s key features. It’s advertised to deliver a 48,000-BTU heat output. That’s a lot! For comparison purposes, a two-burner stove such as Coleman Classic the produces a total of 20,000 BTUs – and that’s the total BTUs from all three burners. That said, the Dyna-Glo DGPH201BR has enough power to provide that much-needed warmth within your patio. Don’t worry. If it gets too hot, you can easily adjust the output by simply twisting a black knob above the electric ignition button. This control panel is located just below the heater itself. 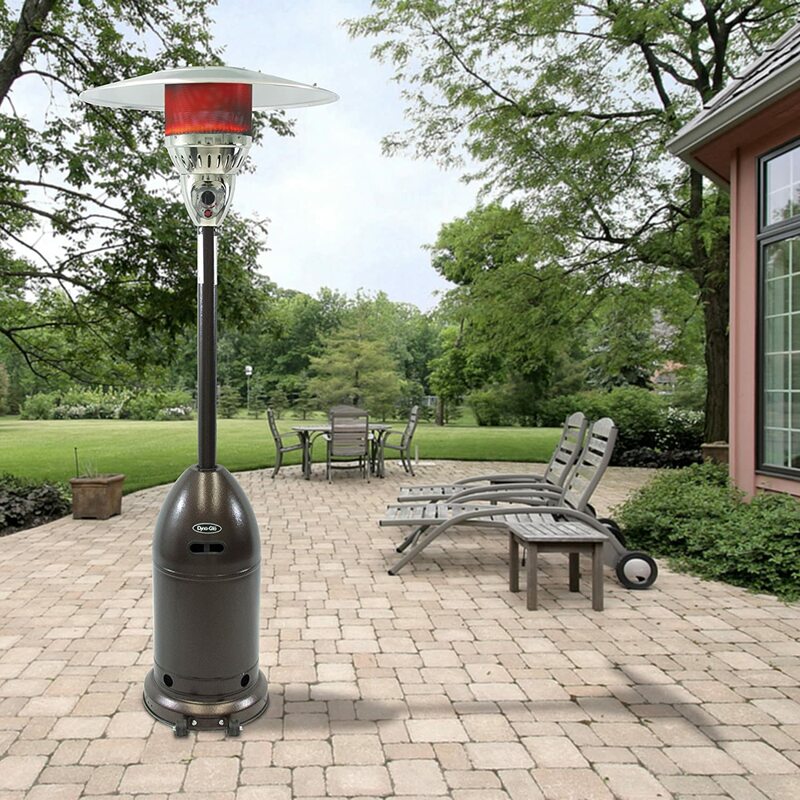 Next, this outdoor patio heater has an anti-tilt feature, which ensures that it doesn’t accidentally fall and cause some problems. Plus, let’s not forget that the gas tank helps weigh it down and stabilize the whole unit. There are also wheels on the side of the base so that you can easily move this heating appliance from one place to another. Yup, it runs on LP gas. A 20-lb. tank should be easy to install and uninstall. How much does this patio heater weigh? How tall is it? As advertised, it weighs 35.2 pounds. Its product dimensions include 32 x 32 x 87.5 inches. In other words, it stands 7.3 feet. How did the Dyna-Glo DGPH201BR fare among previous buyers? Here’s what we found out about the product. We echo what the manufacturer has said. Results vary because as you know, conditions outdoors can easily change without warning. One time, it’s windy, and another time it’s super cold. But as what GHP Group Inc. said, this patio heater should give you a heating radius of 12 feet. 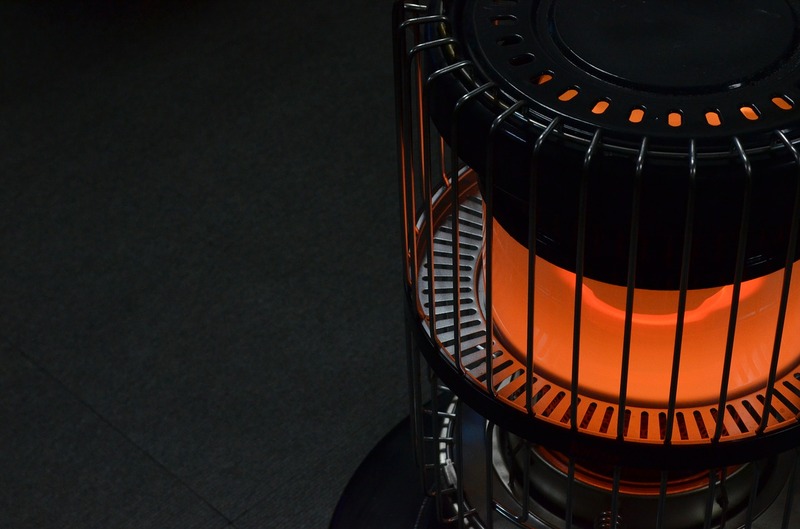 Unlike a fan-forced heater such as the Mr. Heater MH35FA, the Dyna-Glo DGPH201BR runs on propane, so if there’s sound or noise produced in the process, you should barely hear it. This patio heater uses a 20-lb. propane tank (see image on the right). According to the manufacturer, it burns about 2.226 lbs. of propane every hour, which should give you about 9 hours of run time before you need a refill. One of the most common questions is: Does it work when it’s windy? Yes, it does. It’s been tested to perform in windy conditions of up 10mph. According to one consumer, it does put out a great amount of heat. Another said that compared to other brands he’s had, the Dyna-Glo DGPH201BR provides more heat. It requires some assembly, which should be done in less than one hour as long as you follow the instructions properly. There are no special tools needed, but have a Philips screwdriver nearby because you’ll definitely need it. As a tip, one person said that it’s better to have a high-quality screwdriver of your own instead of relying on what’s included. This should make assembly easier. Several consumers have described this heater as “sturdy,” “high-quality,” and “durable.” When it comes to the appearance, the hammered bronze exterior looks nice. Here are some issues and limitations reported by previous buyers. One, it doesn’t come with an adjustable height. As previously mentioned, this heater stands more or less 7 feet. Dyna-Glo DGPH201BR Patio Heater Review: Should You Get One? So… should you get one for yourself? Here’s what we have to say. Yes, get the Dyna-Glo DGPH201BR. Not only does it give out a great amount of heat, but it’s also made from high-quality materials. Let’s not forget to say that it can heat an area of up to 2,400 square feet.